The iconic online sportsbook offers up to £5 on First Goal Scorer Bet, thanks to the BetVictor Champions League Bonus. 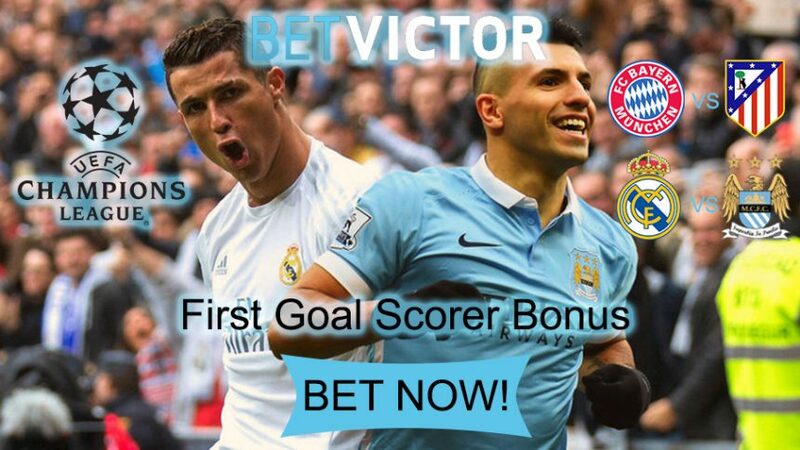 Bet on the return-legs of the Champions League games (Bayern Munich vs Atletico Madrid and Real Madrid vs Man City) and the BetVictor Champions League Bonus will reward you with up to £5 on another First Goal Scorer bet on any football match. All you have to do is make a First Goal Scorer Bet (pre-event or in-play) on any Champions League semi-final games and you’ll receive the special BetVictor Champions League Bonus. You have to place the £5 Bet on another football event within the first 7 days of being credited with the funds. BetVictor Sports strongly favors Bayern Munich to win the game 1.57 (4/7), however all the Spanish side needs is a draw with goals to qualify for the final, so a tie 4.10 (31/10) between them two is likely. A win for Diego Simeone’s men doesn’t seem to be on the cards 7.00 (6/1), as Bayern have made the Allianz Arena a real fortress. Get the BetVictor Champions League Bonus for tonight’s encounter, and the online sportsbook will give you £5 to bet on another First Goal Scorer. Real Madrid are gearing up to face Man City at the Bernabeu on Wednesday, which, just like today’s game, will be decisive. Both teams have great potential within their respective squads, although the Spanish giants have been given preferential odds 1.53 (8/15) since they’ll be the ones playing in front of home fans. Like Atletico Madrid, all Man City need is a draw with goals against the 10-time Champions League winners to make it to the final. But a tie, nonetheless, stands at 4.5 (7/2), while a win for the visiting side is quite unlikely 6.5 (11/2). Collect £5 to use on another First Goal Scorer Bet!